(21175.172, Frank Parman Collection, OHS). (20707.95.25, Oklahoma Magazine Collection, OHS). The county seat of Canadian County, El Reno is located due west of Oklahoma City on Historic Route 66 and U.S. Highways 81 and 270. Situated in the county's center, the town is traversed on the extreme south side by Interstate 40 and on the north by the North Canadian River. As El Reno is divided by the 98th Meridian, the eastern part opened to settlement in the Land Run of 1889, and the western section was included in the April 1892 run into Cheyenne and Arapaho lands. 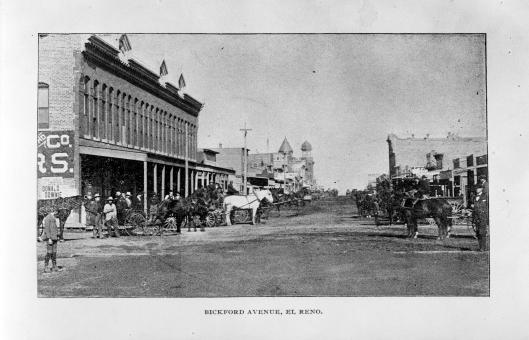 Additionally, the town was one of two sites selected for land district offices in anticipation of the 1901 land lottery drawings, and El Reno was the final selection. El Reno originated shortly after the 1889 land run, with the post office coming into being in June of that year. The town's name was partially taken from the nearby military post of Fort Reno, the "el" being added to differentiate the community from the also-new Reno City, lying was five miles northeast of El Reno. The original townsite was platted by the Oklahoma Homestead and Town Company on 120 acres of the homestead of John Foreman. In 1890 Foreman's 120 acres, along with 80 acres of Thomas Jensen's, were incorporated into the Village of El Reno. Due to legal questions concerning the validity of Foreman's claim, the U.S. Department of the Interior declared the Foreman entry be cancelled and the land opened under the townsite law in February 1892. In November of the same year the interior secretary also cancelled the adjoining entries made by Thomas Jensen and James Thompson. With Foreman's relinquishment in 1893 legal title to lots in El Reno were finally clear. The Chicago, Kansas and Nebraska Railroad line (after 1891 owned by the Chicago, Rock Island and Pacific Railway, or CRI&P) reached El Reno in early 1890 on its trek to from Kansas to Texas. In 1892 the Choctaw Coal and Railway Company (also later part of the CRI&P) completed a line from El Reno to Oklahoma City. This was quickly followed by various company expansions and acquisitions, and El Reno became the crossroads of the main north-south and east-west lines of the transcontinental CRI&P. In addition to a mammoth yard the railroad also constructed division repair shops and a coach-building center in El Reno by the 1950s, representing an employment of thirteen hundred. The CRI&P continued to provide significant employment in the community until the railroad was shut down in 1980 due to bankruptcy. Subsequently, the historic Rock Island Depot (listed in the National Register of Historic Places, NR 83002078) was acquired by the Canadian County Historical Society, which operates it, along with the Red Cross Canteen (NR 75001560) and other historic buildings, as part of a museum complex. Since then, the railroad yards have remained generally vacant property on the north side of town. Due in large part to its central location on the railroad and in the state, El Reno has always had a fairly diverse economy. Fort Reno, established in 1874, became a remount station in 1908 and continued as such until 1948. Since then, the U.S. Department of Agriculture has operated a research/experiment station at the historic fort. Agriculture itself has been vital to the local economy throughout the decades, with elevators and mills quickly being erected along the railroad tracks. Several large, modern elevators continue to dominate the skyline, and various other agriculture-related businesses also thrive. In 1934 the fifth-largest prison in the United States was constructed two miles west of El Reno. Originally called the Southwestern Federal Reformatory, it was restricted to men offenders under age thirty-five. It was renamed the Federal Correctional Institution of El Reno in the mid-1970s, and the population opened to include men of all ages. In the early 1990s the prison remained one of El Reno's largest employers, with 430 workers, and had become a clearinghouse for all prisoners being transported across the nation. Numerous smaller commercial enterprises have further diversified El Reno's economy. 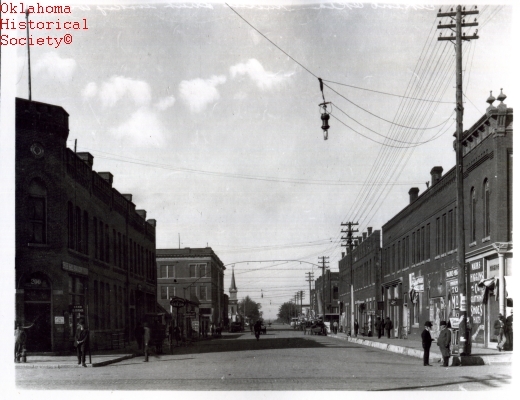 By the mid-1930s the town had twenty-four grocery stores, thirty-eight filling stations, twenty-four restaurants, ten hotels, eight tourist camps, twenty-seven barber and beauty shops, and sixty-three insurance companies, amid a host of other small businesses. Fifty years later, El Reno had nineteen grocery stores, twenty gas stations, thirty-one restaurants, sixteen motels, and twenty-four barber and beauty shops, among a variety of other commercial concerns. Greatly aiding business development was the designation of U.S. Highway 66 (now Historic Route 66) through El Reno in the mid-1920s. The 1960s construction of Interstate 40 to the south has resulted in modern commercial development that tangibly intertwines the interstate and community. 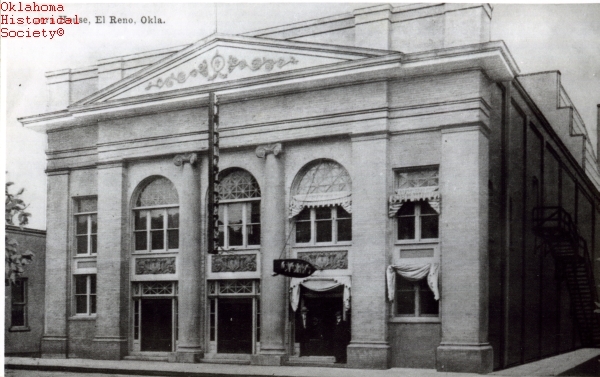 As the county seat for Canadian County El Reno has been a political and governmental center since its founding. Although the existing Canadian County Courthouse was constructed in the late 1980s, the historic Canadian County Jail and Stable (NR 85002790), constructed in 1906, remain on South Evans. Other significant historic resources still extant in El Reno include the 1892 El Reno Hotel (NR 79001988), the 1901 William I. and Magdalen Goff House (NR 88001317), the 1904 Carnegie Library (NR 80003257), the 1909 Southern Hotel (NR 78002220), the 1911 El Reno High School (NR 00000179), and the 1935 El Reno Municipal Swimming Pool Bath House (NR 00000178). In 1890 El Reno had a population of 285. Ten years later the town had grown by nearly twelve times, sheltering 3,383 residents. In 1910 the city more than doubled to reach 7,872. The ensuing decade is just one of two for which El Reno experienced a population decline as the 1920 census recorded 7,737 citizens, a drop of 135 persons. By 1930 the population increased to 9,384, and by 1940 it exceeded the 10,000 mark by seventy-eight people. In 1950 El Reno had a population of 10,991. Gaining just twenty-four residents, the 1960 population was 11,015. By 1970 El Reno had 14,510 residents, and 1980, 15,486, and in 1990, 15,414. In 2000 the census registered 16,212 inhabitants, and in 2010, 16,749. El Reno has supported a number of newspapers over the decades. Among early-day organs were three German-language newspapers, Der Courier, the Oklahoma Volksblatt, and the Oklahoma Staatz-Zeitung. Several others were absorbed by other papers and continued publication under various other names. One of the longest running was the El Reno American, which began publication circa 1901 and continued to 1988. By 2000 the El Reno Daily Tribune, which began publishing in 1930, remained the community's lone newspaper. Educational offerings provided in El Reno include Redlands Community College, which gives area residents access to the state's two-year junior-college system, and Canadian Valley Area Vocational Technical School. The city maintains a mayor-council government under a home rule charter. "Canadian County" and "El Reno," Vertical Files, Research Division, Oklahoma Historical Society, Oklahoma City. Daily Oklahoman (Oklahoma City), 6 May 1984. History of Canadian County, Oklahoma (El Reno, Okla.: Canadian County History Book Association, 1991). Cynthia Savage, "El Reno," The Encyclopedia of Oklahoma History and Culture, https://www.okhistory.org/publications/enc/entry.php?entry=EL001.